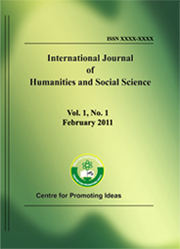 International Journal of Humanities and Social Science (IJHSS) is a monthly peer reviewed journal published by Center for Promoting Ideas (CPI), USA. The editorial board is recruiting reviewers for the journal. Please note that it is a voluntary activity and hence no financial remuneration will be given to the reviewers. The language of the work is English. The medium of the work is internet.